EDIT: Giveaway is officially over. Congratulations to Michelle Tucker for submitting the randomly-chosen 1222nd entry. No need to keep an ear to the ground for the latest in fairy fashions - I have the lowdown that will lift your sparkly slippers into the air right here. 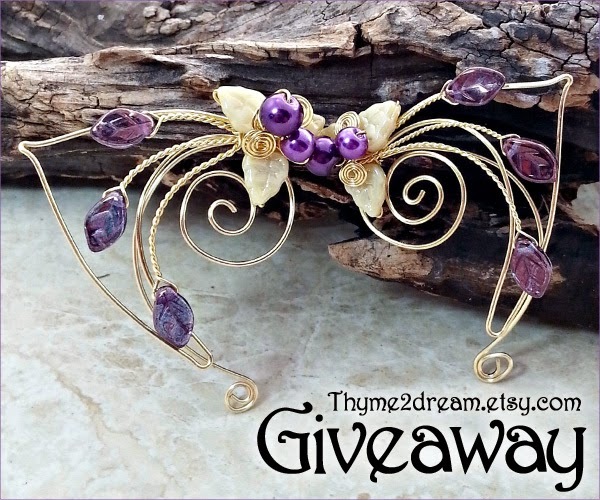 Karla debuted a delightful design in her Thyme2dream Ear Dreams collection this month! Her new elf ears are easy to wear ear wrap cuffs that require no piercings at all, can be worn with or without regular earrings and fit easily over the back of the ear. The elven jewelry is crafted using nickel-free wire with a non-tarnish coat that makes it comfortable to wear even for allergy sufferers. Want to hear even better news? Karla's so excited to spread the word about her new product that she's giving away one pair of elf ear cuffs in winner's choice of color! (Shown above is her Sugarplum color scheme in plum and ivory tones.) One of the additional ways to enter to win is to sign up for her newsletter, which even includes a $10 coupon for her fantasy jewelry. As if that weren't enough, she's offering 25% off any total order in her Etsy shop, just use coupon code "AQGV15" during checkout before February 28, 2015. Use the Rafflecopter below to enter to win worldwide giveaway before 11:59pm EST on February 20, 2015. Be sure that the mandatory comment on the blog post includes the same name you use to fill out the Rafflecopter - all entries by winner must be easily verified or a new winner will be chosen. Not including usernames when asked will also get you disqualified. 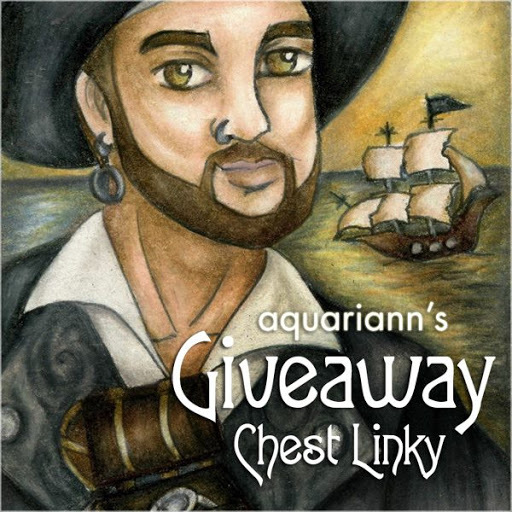 Disclaimer: Disclaimer: The featured seller (not the hostess, Aquariann) is responsible for providing free prize. 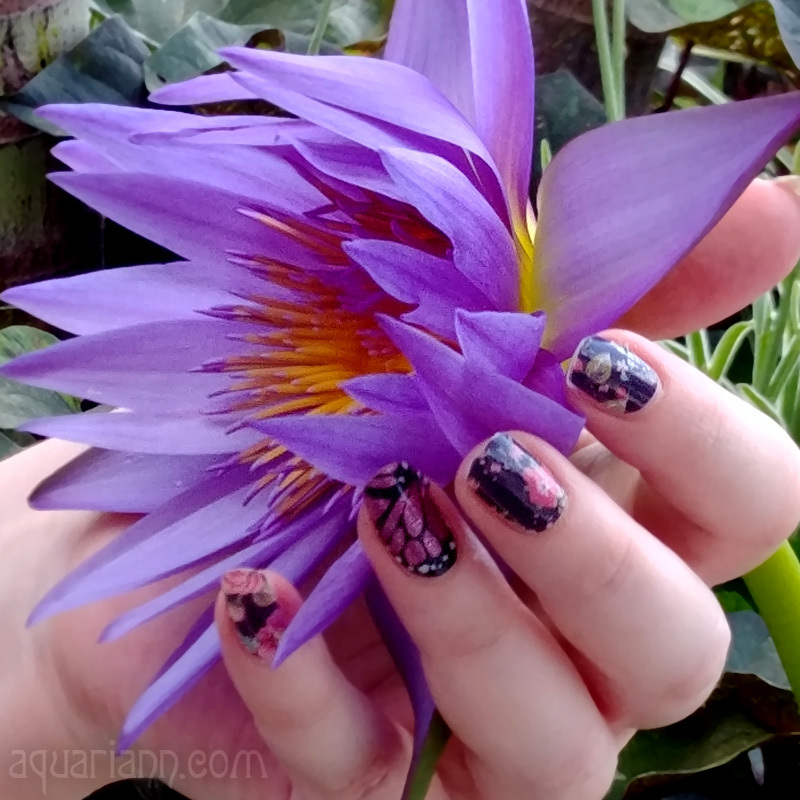 Aquariann was not paid to write the promotion, but does accept thank you gifts if sellers are pleased with results. Promote your handmade jewelry in a whimsical way by sponsoring a giveaway, too. Beautiful work! I've tried my hand at wire work for a couple of projects as well, and I've never been able to get the hang of it. Your work is mindblowing and the detail is amazing! My favorite piece from you so far probably has to the Ivy Leaf Elven Tiara Headdress. The braiding is incredible! Keep up the amazing work! Everything is gorgeous! I love the Wood Nymph Mistletoe Tiara! No woman should be without a tiara - the ultimate accessory to any outfit! Apologies to Karla & Kristin my Tumblr name is k8053. Oh My I love these ear cuffs so much!!! Thanks for the chance! So many favorites to choose from. I think I like the Ear Cuff Wrap Vine Spring Green Ear Dreams best though. I love the Sugar Plum Fairy Ear Cuff. Tree of Life Tiara Elven Circlet Headdress is my fave, but I love everything! I think the Fairy Lights Magic Forest Ring is beautiful. I love the Heart of Inara Serenity necklace! Another jewellery make with so many gorgeous designs. My first choice is Lothlorien Crystal Art Nouveau as an Arm Cuff even though it will highlight how pale my skin is. OMG! I saw this in the shop and KNOW my kids would love it. We had bought a couple bubble wands like this at a craft fair a couple of years ago, and we've wanted more ever since. This one is really cool! Great giveaway, Kristin! I think my favorite is probably the Fairy Lights Gold Leaf Earrings! They are gorgeous! I like this one. https://www.etsy.com/listing/169195773/holiday-gold-fairy-earrings?ref=shop_home_active_12. Gold fairy earrings. I think it looks good on me. Autumn Cornucopia is my favorite! So pretty!! I have to say, the work is stunningly beautiful. The colors are so vivid and really give each piece a magical dreamlike quality!! It made it really a battle to choose but the Celtic Knot Boudica Bracelet Arm Cuff was the clear winner in the end!! The set was even more fabulous!! J'aime les " Snow white winter woodland ear cuf ". Fave item: Victorian Twilight bracelet. Princess Bride Snow Crown is beautiful. I love the Sugar Plum elf cuff and the Titania's Dream fascinator (plus, A Midsummer Night's Dream is one of my fave Shakespeare plays!). oh my, i LOVE the tiara section of your shop! it was hard to choose, but I think the Art Nouveau Elven Beaded Headdress Tiara is my favorite. I love the "Fairy Lights Holiday Sparkle Necklace"
Two of my favorites are the Heart of Inara Serenity Necklace and the Rivendell Elven Art Nouveau Necklace. Definitely the lovely ear cuffs! Love this sweepstakes the pieces are so beautiful! I so got my fingers crossed I win. Good luck everyone! I adore the Princess Bride Snow Crown Tiara. I absolutely love the Fairy Lights Holiday Sparkle Necklace! My fave is sapphire blue ear cuff set. This is soooo pretty! I LOVE ALL OF YOUR STUFF! I really like the fairy lights forest ring. I would choose the Celtic Tree of Life Elven Hair Comb. I really like Evenstar Elven Forest Earrings.So beautiful. I love Red Fairy Elven Forest Triad Necklace, my name in Rafflecopter is the same. Emerald Isle Irish Celtic Knot Headband Circlet is absolutely lovely!! I really like the Midsummer Nocturne Tiara Woodland Fairy Crown! What a great website! I think my wife and daughter would love the Art Nouveau Elven Beaded Headdress Tiara in Custom Colors. I love the Emerald Isle Irish Celtic Knot Headband Circlet. It's gorgeous! I love the Princess Bride Snow Crown Tiara! I want the Celtic Ivy Leaf Headband Fascinator. I have never seen anything like this. It is soo cool. Two of my most favorite favorites are the Lorthiorien Crystal Art Necklace and the Sophias Fairy Woods Wrist Corsage Bracelet - among many many many others! There are so many beautiful pieces to choose from, one of my favorites is the Art Nouveau Ear Cuff Wrap Autumn Cornucopia Ear Dreams. I really like the Celtic Tree of Life Elven Hair Comb. Thank you for the lovely giveaway everything is dreamy! Custom Elven Wedding Headdress, but really all their work is wonderful. 2 Circlets, 1 custom headdress, 1 crown, 1 bracelet, 2 sets of ear cuffs and 2 sets of elf ear cuffs on order. :) Simply love their work! My favorite item is the Custom Tree of Life tiara I ordered for my wedding almost two years ago. It's elegant and magical and inspiring. I love the golden slumbers arm cuff. I am in love with the princess bride tiara. So gorgeous. Do I have to pick just one? I love the moon and blue fairy cuff... and the celtic valentine and celtic knot.... ummm..... okay - the celtic valentine... so passionate!